When we (“we” being my brother, two sisters, and myself) were young, our parents would occasionally tell us stories of their early marriage – presumably when they were in a nostalgic mood, thinking back to a time when they didn’t have four children, a mother-in-law, and an aging collie to look after. Of course they often mentioned the absence of “modern” conveniences, such as television, and told how they entertained themselves by reading to each other. 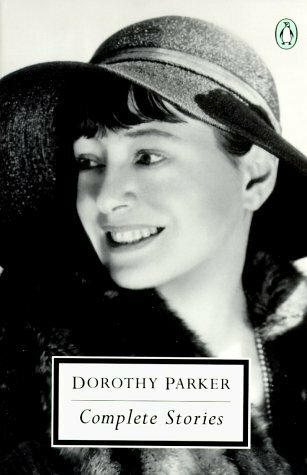 One of the authors that they most loved was Dorothy Parker and, as we grew older our father, a true dramatic reader, sometimes shared her stories with us. I loved, and still love, this complete collection. Parker knew women, she knew the dark side of the bright smile, and she used her incredible talent to shine a light.
. . . Parker exploits the apparently trivial – telephone calls, social invitations – in order first to extract, and then to reveal, a theory concerning the larger implications of the difference between the sexes. A family favorite was “The Waltz,” first published in 1933. This is a dramatic monologue, spoken by a young woman who has the unfortunate experience of agreeing to dance with a man who appears to be one of the world’s worst dancers. The piece is written in a way that we first “hear” her spoken words, which are followed by her internal dialogue. What can you say, when a man asks you to dance with you? I most certainly will not dance with you, I’ll see you in hell first. . . Oh, yes, do let’s dance together – it’s so nice to meet a man who isn’t a scaredy-cat about catching my beri-beri . . . I imagine that Dad figured this was one of Parker’s more benign stories, and so it was to the juvenile ear. The satirical underpinnings were lost on me. However, recently I’ve revisited the complete collection and, from an adult point of view, recognize this as emblematic of all of her stories: insecure young women who depend on the recognition from and approval of men for their own self-respect. She used humor as a weapon in the battle of the sexes, and she used it effectively. The fact that she is funny doesn’t diminish the fact that she had her finger on the pulse of the times. But in rereading this collection it occurred to me that, in many ways, her point of view can’t be considered antiquated. One has only to read advice columns or watch women on TV (Two Broke Girls, Jersey Shore, The Kardashians to name a few) to recognize that many women haven’t “come a long way, Baby”! Where is Dorothy Parker when we need her? I suppose the next best thing is to get your hands on a copy of her story collection – I promise you’ll be entertained, as well as touched and, perhaps, a bit outraged.